Update to this previous story. Others noted that Trump is now the commander in chief, not a political candidate, and they saw nothing wrong with service members supporting him. The White House did not immediately respond to a request for comment. 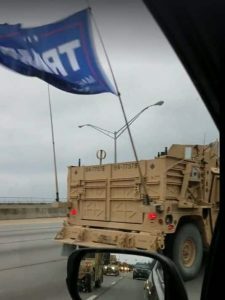 A Department of Defense spokesman said Monday he thought the trucks were military surplus and being driven by private citizens. But experts on military transport said they were equipped with expensive technology, including ballistic glass, that wouldn’t be seen on a decommissioned vehicles, and that they probably belonged to the Navy SEALs or other special operations forces. The trucks also bore numbers that match those used by the Navy. The Navy Special Warfare Command is part of the U.S. Special Operations Command, which is responsible for overseeing and conducting special operations and secret missions. It specializes in unconventional warfare, direct actions, counterterrorism, special reconnaissance and personnel recovery.